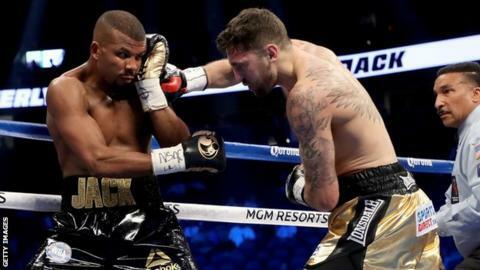 Nathan Cleverly lost his WBA light-heavyweight title in a punishing stoppage defeat by Badou Jack in Las Vegas. The Welsh fighter, 30, started solidly but was caught by left hooks from the Swedish fighter in the second round. That saw Cleverly's pace drop, allowing Jack to land a barrage of lefts in the fourth, cutting his opponent. And more of the same in the fifth prompted referee Tony Weeks to wave the bout off, despite Cleverly's protests. Jack, who had stepped up from super-middleweight for the first time, raced to the corner to salute fans, though many were still outside the T-Mobile Arena with time to spare before Floyd Mayweather and Conor McGregor contest a much-hyped main event. Cleverly had spoken of his excitement at being on the undercard for what could become the richest bout in boxing history, but his night turned sour quickly as Jack showed more variety from the second round on, attempting combinations while his rival only flicked jabs. There had been rumours among media in Las Vegas that the Caerphilly-based Cleverly was struggling to make the 175lb (79.4kg) weight limit. In truth, he did seem to run out of gas quickly, forcing him to spend much of rounds four and five on the ropes, bobbing and weaving to desperately avoid trouble. But he was in deep water, Jack had looked relaxed all week and he did here as he picked his rival's defence apart. The left hand proved a go-to weapon. Cleverly's pawed jabs were countered with ease, he was simply proving too easy to hit. Four big left hands landed in the fourth, prompting howls from those ringside. Jack, who gave up his WBC title to move up a division, has a fine record against British fighters, having drawn with IBF super-middleweight champion James DeGale and beaten WBA king George Groves. He is a tough man and hyped out of Las Vegas' Mayweather Boxing Gym, with just one defeat in 25 career fights. Beating him would have proven Cleverly's finest hour by his own admission but he never threatened to defend the title he took from Juergen Braehmer in October. A two-time world champion at the weight, Cleverly will now have to take stock after the fourth loss of his 34-fight career. He has returned to world level from tough defeats to Tony Bellew and Sergey Kovalev in the past but now again finds himself with questions to answer.